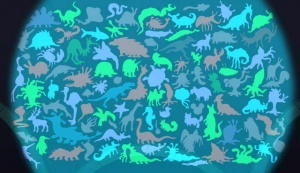 By the year 3000, it is not only humans who roam the Earth, or for that matter, the universe, there are several thousands other species out there. Most are united under the Democratic Order of Planets, while others wage war upon the others. The Amazonians are giant man-hating women who live on Planet Amazonia. With Amazonian men being extinct for hundreds of years,it is unknown how exactly they keep their reproduction. The Amazonians have been known to wear very revealing clothing and have a rather primitive civilization. The females also seem to have some Earth-like traditions, such as basketball. The Borax people are an unknown race with only one known member, The Borax Kid. The Borax Kid is an alien made completely of borax. This race, like the Rock aliens have mental powers that can change gender for all we know. Amphibiosans are from Amphibios 9 and strangely have no bones. However they are supported by a system of fluid filled bladders. Their bodies are very flexible and they aren't very strong. They can also change the color of their skin, similar to chameleons. Male Amphibiosans can become pregnant whilst they're in love with just the touch of a person's hand. When a Male mates with the soulmate, they go into a so-called:Receptive State,their skins then become Semi-Permiable membranes allowing the passage of genetic material. When its time..., the young come out from the males ... in the form of one big, lumpy puddle of what looks like frog or fish eggs, the offspring then emerge with the big-eyed head of an adult Amphibiosan and must survive to the swamp, where they will then go through a frog-like cycle at the end of which,they become land walking children. 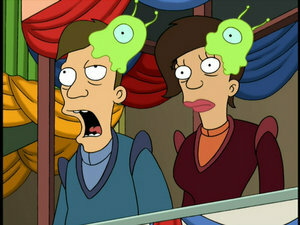 The Brain Slugs are gelatinous parasites from the Brain Slug Planet. They attach themselves to the heads of sentient beings, hijacking their hosts' cognizance in the process, and try to trick other sentients into likewise acquiring brain slugs. 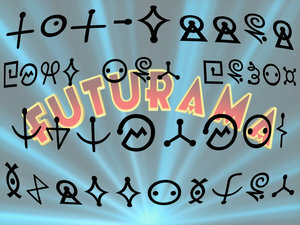 They even have their own political party on Earth. 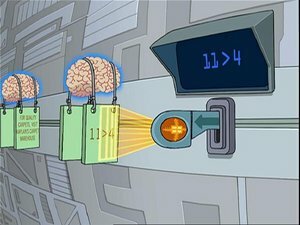 Fry contracted a brain slug in "Raging Bender", but it starved and died as Fry's intelligence was insufficient to sustain it; this could also imply that the brain slugs feed off of the Delta brainwave, which all intelligent beings, save for Fry, are said to have. The Brain Spawn existed from a few seconds after the Universe was created. They are arch-enemies of the Nibblonians and want to know and understand the Universe. They also want to destroy all things in the Universe. Only Fry is impervious to them as he lacks a "delta brainwave". 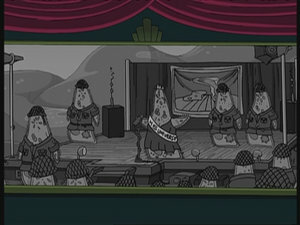 The Blobs are a species of jellyfish-like aliens of unknown origin who have settled on Earth, Venus and the rings of a nearby planet. All known Blobs are easily angered. 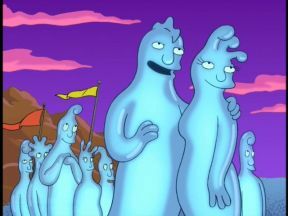 They seem to have no internal organs, such as a brain, but they may have a network of electronic pulses that run through their gelatinous bodies. 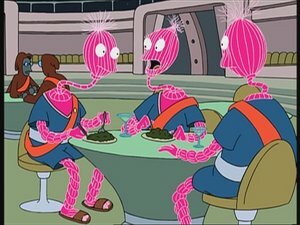 The Cygnoids are from the planet Cygnus 5. They don't have a great knowledge of human food or culture. They are cockroach resembling life-forms that seem to act as immigrants and are mostly Italian. The have huge, bulky muscles, antennae, and various shades of red/orange skin. The Decapodians are lobster like creatures from the Planet Decapod 10. The Decapodians once invaded Earth and enslaved Humanity. 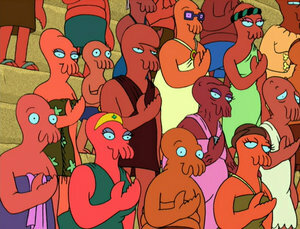 There are many famous Decapodians like Harold Zoid a famous actor and his nephew Dr. John Zoidberg who ate the Earth Flag and then saved the Earth. Over millions of years, an ancient race of either frogs or snakes evolved into a mighty species known as the Encyclopods. They resemble gigantic manta rays, with an atmosphere-like dome and eggs that have the appearance of Violet Dwarf Stars. They apparently have the power to communicate with their minds. They harvest DNA of every endangered species. For years they have battled the Dark Ones, in the Arms Race of Evolution but finally won in 3009. 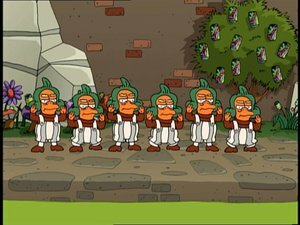 The Grunka Lunkas are small orange men who inhabit the planet Wormulon. 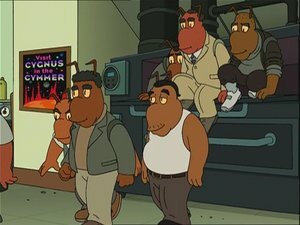 They are employed by the Slurm Worms to work in the fake Slurm factory. 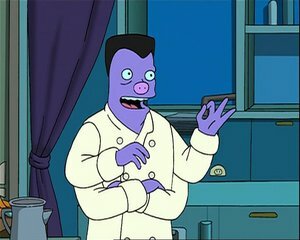 They sing a warning song about the Secret Ingredient of Slurm. 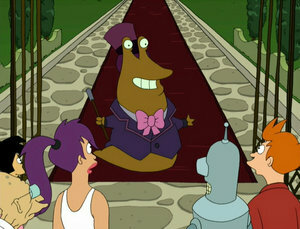 They were a parody of Oompa-Loompas. The Maggotians are a species similar in appearance to an earthworm or maggot. 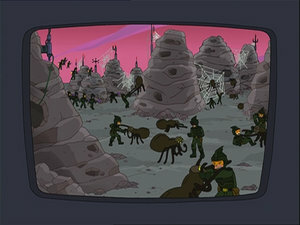 In the Time Bender Trilogy, they are depicted as fighting alongside Earth in the alternate-reality "Worlds War 1", both because they feel the attack is unjust, and there will be lots of corpses for them to feed on. 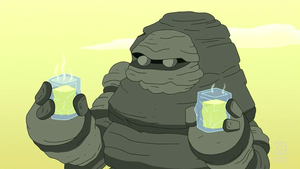 Morbo's species are green alien creatures. Very little is known about the species; we know not their name or their home planet, and the only known creatures are Morbo and Fawn. 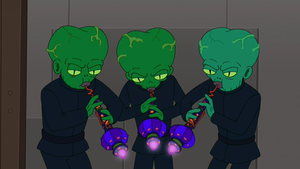 We know from what Morbo has said however that his species has a large society, and it seems they are planning an attack on Earth. The Native Martians are the original inhabitants of Mars. They sold their land to the Wong family for a giant diamond, which they thought was worthless, as they had no concept of ownership. They left Mars, bought a planet with the diamond, and abandoned the Martian caves. These caves would later be used by the Legion of Mad Fellows. Neptunians are a humanoid species from Neptune which shares many characteristics of humans. There are a few differences though: Neptunians have pig-like noses, purple skin and four arms, and their hair is almost always black. The Neutrals are humanoids of average height and build. 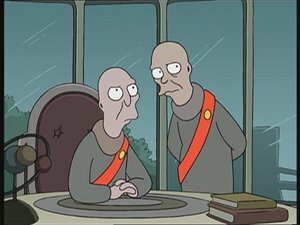 They are hairless, their skin is a dull grey, and their faces are not capable of displaying emotions. In fact, it's not entirely clear if they have emotions at all. They have a very detached outlook on life. Nibblonians stand about one foot tall, hairless, and have two large eyes as well as a third eye on an antenna in the center of their foreheads. 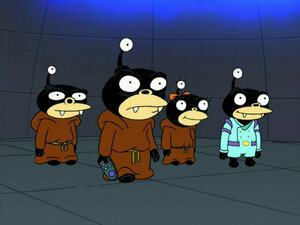 They are black in color, with pale yellow circles on their bellies and around their mouths. They are widely considered to be the cutest race ever to exist, though this is something the Nibblonians resent, even though they exploit it. 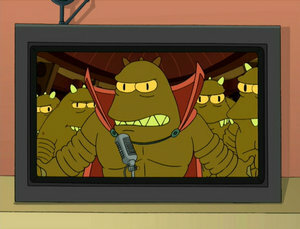 The Omicronians are a violent, aggressive race from Omicron Persei 8. Omicronians stand around eight feet tall, and have characteristics of reptiles. Their skin can have various colours, ranging from a greenish-yellow to dark brown, their eyes are yellow with oval pupils. 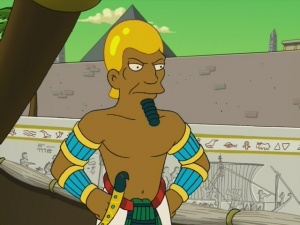 The Osirians are the rulers of Osiris 4. They use captured slaves to build giant buildings and tombs for their cities. There are four known species living on their world: A species that resembles humanoid brown/orange-skinned birds, jackal creatures, human-like people,and much more superior human-likes. It is unknown which (if any or if not all) are native. The Parameciums are an alien species that have one goal. To wipe out the human race. Rock aliens are a species from the planet Neutopia. This species is best known for producing and selling the soft drink Slurm. 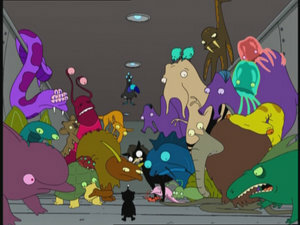 All the galaxy's Slurm is produced in a factory on their home planet. 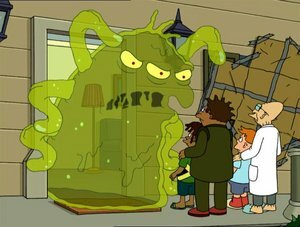 However, this factory is a front, as the true secret of Slurm is that it is actually a fluid produced by the Slurm Queen. 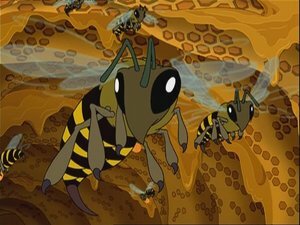 The Space Bees live in giant space honey combs. They are ruled by a giant Bee Queen who produces royal jelly. 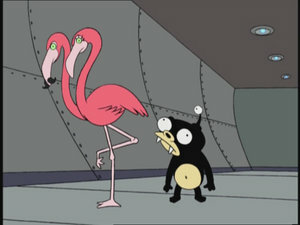 They communicate through dance, make space honey and can't drink Slurm. 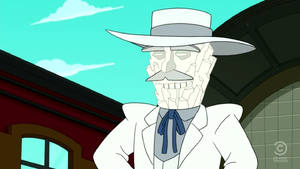 They also were responsible for the death of the previous Planet Express crew. The Spheroids are giant balls that inhabited Spheron 1 until they were driven out by DOOP forces. 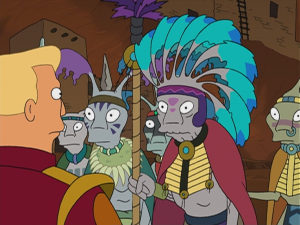 According to Zapp Brannigan, humans "know nothing about their language [or] their history". Spheroids are ruled by the "Brain Balls" and had to surrender to DOOP when it threatened to blow up their planet. The Spiderians are giant spiders that once lost a war with Earth. The Spiderians weaved a picture of Zapp killing them while he was actually killing them. Though they are similar in appearance to spiders they are more closely related to Earth's elephants. It is unknown exactly how many of them Zapp killed, where he could have killed all of them. 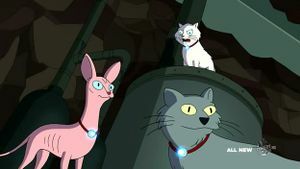 The Thubanians are talking cats from the ninth planet of the star Thuban. The Trisolians are a species whose bodies are made from liquid-matter. At night they glow as part of their nocturnal phase. 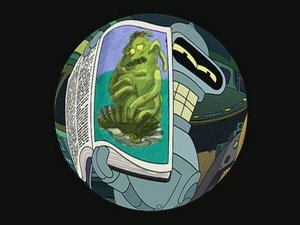 Bender showing the picture "Venus de Venus" to Planet Express Ship. 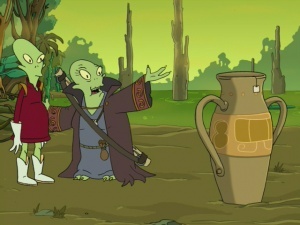 The Venusians are mentioned throughout the show in many forms. The painting Venus de Venus shows a female blob so Blobs may actually be Venusians. 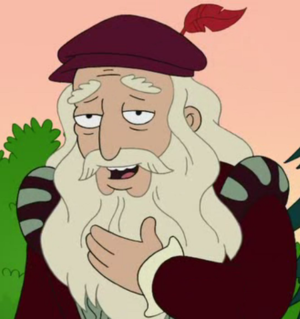 The Vincians come from Planet Vinci, and resemble humans, but apparantly live of very old age; In 3010 da Vinci still looks the same as 1500 years earlier, and even then he looked fairly old. They are also extremely intelligent as a standard, though this may be cultural and not biological. The Yarn People come from the planet Nylar 4. 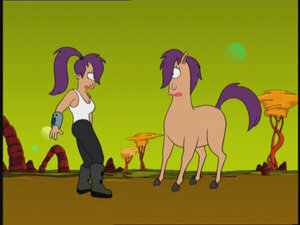 Leela was accused of trying to assassinate the ambassators of Nylar 4 with a pair of scissors by Zapp Brannigan at the reception. Buggalo are giant beetles with cowskin-colored shells that can be milked like present-day cows (extinct in the 31st century). 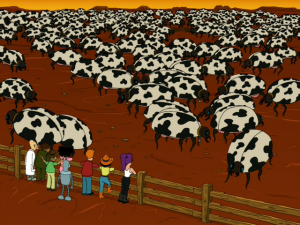 They even moo like cows, and are kept on farms. The bone vampire is a near-extinct species that feeds on skeletons by sucking them out, leaving a puddle of flesh. The creature also reproduces asexually. A fourth-dimensional vacuum creature that feeds on obsession, it enters the three-dimensional universe to hunt and fill its lungs with vacuum. An animal that inhabited Vergon 6. It has an amazing ability to mimic the appearence of anything or anyone. It may now be extinct as the planet imploded, but should have been preserved by the Encyclopods. Arachnids with yellow eyes, a red body, and purple legs, from the 1979 Namco arcade game Galaxian. An animal that inhabited Vergon 6. It may now be extinct as the planet imploded. It resembles a flamingo with two heads. The Lovey Bears are genetically grown by Lovecorp who then kill them, stuff them with fluff and sell them at affordable prices. 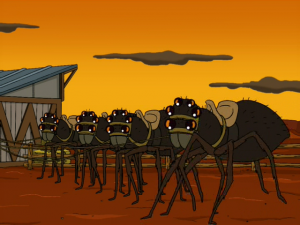 Martian spiders are used for transportation (as horses) at the Wong Ranch on Mars. 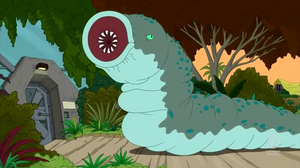 The moon worm is an alien that Al Gore's head claimed in 3003 that he had ridden (4ACV08). 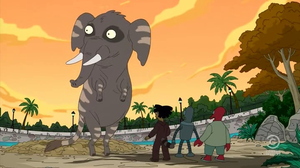 There are some prairie elephants on exhibit at the zoo on the planet of the primates, Simian 7. The purple fruit snake is a native to the planet Vergon 6. 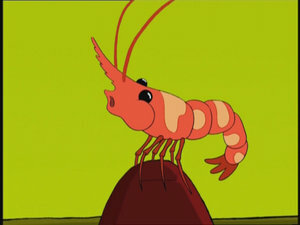 This is one of the species the Planet Express crew needed to save from extinction. 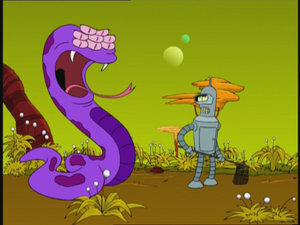 Unfortunately Nibbler ate the Snake along with the other animals. However it was most likely saved by the Encyclopod. 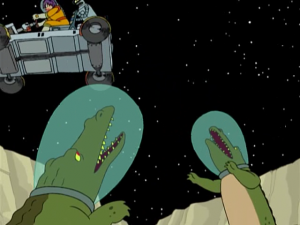 Space alligators live on the moon. They dwell within the moon's many valleys, require oxygen masks to survive and, like alligators on Earth, are very territorial. It is unknown how they got to the moon, though they were probably placed there by moon colonists. The windy shrimp was an animal that inhabited Vergon 6. The race could apparently blow at extreme forces. It may now be extinct as the planet imploded. But, like the purple fruit snake, it might have been saved by the Encyclopod. This page was last edited on 4 April 2016, at 16:20.